"Why are we the only ones saying excuse me?" I wondered out loud as we made our way to dinner our first night in New York City. I was carefully noting the numbered streets and avenues at each intersection while trying to avoid people bumping into us or quickly pushing by. "They're all in a hurry and very rude!" my granddaughter said righteously. We finally found the lovely Joe Allen restaurant; walking down steps into linen-tablecloths, celebrity photo-covered walls and a menu with eye-widening prices! Toasting each other with a Shirley Temple and gin and tonic, we hungrily ordered chicken Caesar salad and an Angus burger...perfect meals after a long, snacks-only travel day. The only kid and grandma duo among the suits and theater-going couples; the servers were eager to welcome us and offer fun suggestions. Over dinner, we discussed the people in the streets; they think we're 'just tourists' said my sweet girl with teenage sarcasm.There seemed to be a method to their madness I suggested.....do they just barge along and others know enough to dodge them? How annoying we were stopping for photos; in awe of skyscrapers, bright lights, piles of trash and people cutting in front of moving vehicles. The next morning we headed to Pier 83 in rainy, chilly wind. As we politely lifted and shifted our umbrellas so as not to poke anyone...while getting poked and dripped on ourselves...she figured it out! "It's like dodge ball" she announced. Watch this! And she quickly walked ahead, zigging and zagging to avoid those coming toward us as well as those following behind. Me...not so much. Trying to control my umbrella, holler don't go too far ahead and not bump anyone...I wasn't catching on at all. Why don't people stay to the right like suburban malls, walking trails and airport terminals? On the Lady Liberty cruise she chastised me for not seeing how easy it was. "Don't be so nice, don't keep saying excuse me, Grandma! Just go!" Not my style, darlin', I tried to explain. Walking back, head down against the wind and chilled to the bone, I suddenly didn't care if I stepped in someone's way. Enjoying hot chocolate and a cupcake at the Cake Boss Café, I was congratulated with "you did much better, Grandma!" Oh no! Was I setting a bad example by praising her hustle-bustle street smarts; showing my age fretting about manners? We walked everywhere the next few days; from 5:30 AM through empty streets for the Today Show to the late evening theater crowds around Times Square. But it was the mile-long walk from our hotel to the Empire State Building when "walking like a New Yorker" finally kicked in. I watched for openings and darted to the left or right, scooted around strollers and luggage-pullers, crossed against lights, quickened my pace passing slow walkers and never once excused myself! But I smiled a lot! Smiled and people smiled back. They respected me and understood I knew what I was doing... at least I like to think so! I had the confident stride and knowledge of where I was going. (A straight shot down Fifth Avenue!) I let her go ahead, saw her glance over her shoulder with pride as she checked on me. What easy freedom it is to walk the City streets when you know how it works. You feel the energy of aliveness and purpose and realize those who live and work in the city are just decent, caring people going about their business; hoping the next visitor figures it out sooner rather than later! Great article Joan! Made me remember my trip there, many years ago! So glad you had fun! Great fun, Teresa! I ended up depending on her and she was thrilled to lead the way! Congrats on mastering the skill! And also for noticing the style! What a difference a day can make; going from frowns and annoyance with bumping/brushing to smiles, avoidance/acceptance and enjoyment! It was a lovely learning experience! Thanks Carol! I have been to New York many times. I love the energy of walking the streets. Sounds like you guys had an amazing time! We did! The streets were great fun and great exercise! We used to go to Joe Allen's when we went to theater when I was growing up on Long Island. New York can be intense, but I'm so glad you enjoyed your visit! Our concierge suggested it; we had a short wait and such a wonderful meal! I had not planned any meals so Joe Allen's the first night set the bar! Intense is a good word; but it's a positive, purposeful intensity that pulls you in! Thanks, Sharon! I loved hearing all about New York and the busy streets. Sounds like you and your Granddaughter had a wonderful time! I am so glad you go to do this together -- what wonderful memories for both of you. Her choice to vacation there with me. She hadn't bargained for the crowds and busyness.....but she sure adapted and learned lots about life other than her Ventura beach neighborhood. Ha! I'd love to do the dodgeball walk in NYC. Such a great analogy from your granddaughter. Thanks for the tips and the great photos (even if they annoyed others when you stopped to snap them!). She was trying to explain it to me.....thinking I'd catch on better! Yeah...we got a little carried away thinking every corner was sooooooo New York! Wonderful post--and I think it should be required reading for anyone visiting the city. Thanks Olga! Funny how I had so many great tips and suggestions from pals but no one mentioned the crowds and how to move gracefully through them! Really cool! I grew up on Long Island in the 60's and 70's, so going 'into the city' was a big deal for us. I haven't lived in the area since my 20's and can totally relate to what you're saying. Even though it's home, many times when I go back, I feel like a tourist. Thanks for sharing! What a lovely post. And you're absolutely right about everything. 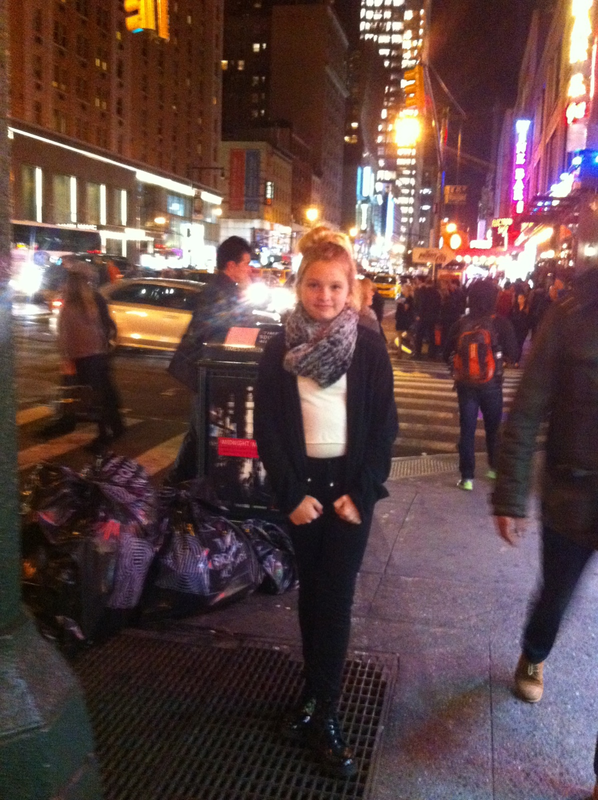 I'm a New Yorker. It is like dodge ball, and yes, New Yorkers are decent people.